For over 30 years Traymark has been servicing the Industrial Caravan Industry. Leading the industry in the design and manufacture of a wide variety of mobile units . The quality of Traymark Industrial Caravans is proven over time, to withstand the adverse conditions experienced across the country . Traymark Industrial Caravans is proudly an Australian owned and operated company which operates from our manufacturing facility on the Gold Coast of Queensland, Australia. We realise the importance of purchasing goods and services from local suppliers and using Australian made products and do so when possible. 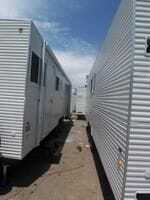 Traymark Industrial Caravans specialises in the design and manufacture of Industrial Caravans & Mining Accommodation. With the owner having over 35 years' experience, you can be confident that you will receive a carefully designed and well-constructed unit that will last through the rigors of constant movement throughout the states. We have built over 1000+ units from our facility here on the Gold Coast, the units range from basic site offices and lunchrooms through to fully self-contained accommodation camps as well as specialised projects such as mobile shops for Telstra. We are an established supplier of Industrial caravans to many local and interstate government departments as well as commercial customers, both large and small. We can manufacture from the plan or completely custom design a unit to suit your requirements. We work closely with our clients in the design stages in order to determine the purpose of the unit and what the requirements are. All Traymark units are designed with strength and durability in mind along with a reasonable finished weight thus not to impede easy relocation. 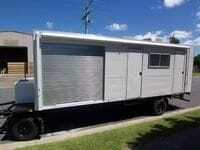 Our standard design units are built with welded steel frames and high tensile colorbond external sheeting. We have also custom designed lightweight units which have incorporated composite panels or aluminium frames with aluminium external sheeting.